Why does it seem like everyone's raving about kabocha squash? We've seen this winter squash at Japanese and Korean restaurants and now with this easy recipe, you can see what all the noise is about. Kabocha is naturally sweet, with a flavor that's a cross between pumpkin and sweet potato. (Oh, yum!) Here, we braise it liquid that was used to soak dried shiitake mushrooms. This adds that super savory, umami flavor. Oh, and did you know that you can totally eat the skin on kabocha? We are 100% OK with that because, to be honest, peeling winter squash is a big pain. When shopping for your kabocha squash, look for one that's heavy for it's size. That's how you'll know that it's holding a lot of moisture and, therefore, super fresh. The skin will be bumpy and look dull. Apply gentle pressure all over and make sure it doesn't have any soft spots. Per Serving: 155 calories; 1g fat; 37.3g carbohydrates; 5g protein; 0mg cholesterol; 492mg sodium. I really enjoyed this dish! It paired perfectly with rice and an onion soup that I prepared on the side. I rarely think to cook kabocha, but I'm so glad I did. 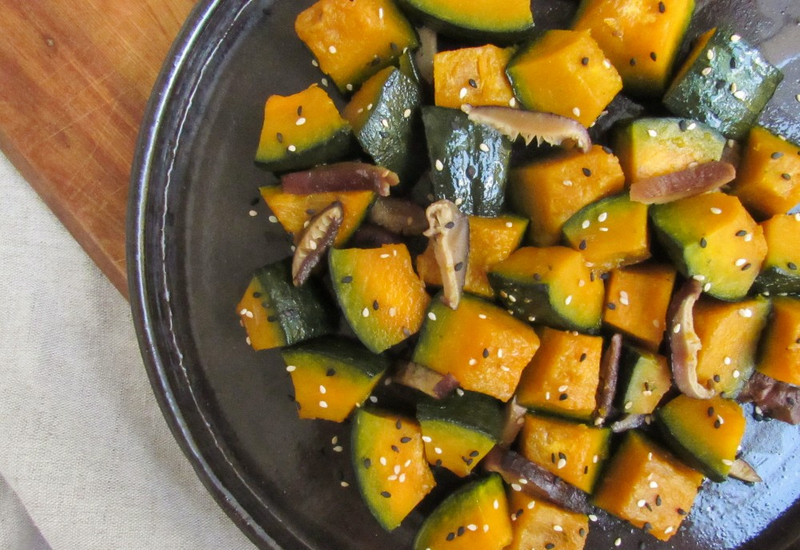 Using kabocha is a nice switch from zucchini. I really like this method of braising them in mushroom broth. It's a great side dish to Korean beef.